Sarah Addison Allen is one of my go-to authors for comfort reads. I think everyone who’s ever read any of her books know this. There’s something about her words, the magic realism in her novels that just hits the right spot. So I was very excited when Lost Lake came out, and I couldn’t wait to get lost in this new, magical world crafted by her SAA’s words. A year after her husband’s death, Kate Pherris wakes up. Her mother-in-law, Cricket, plans to move her and her daughter Devin with her, but Kate didn’t want anything to do with it anymore. 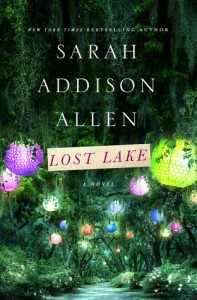 When Devin finds a postcard from her Kate’s Aunt Eby from Lost Lake, the mother and daughter drive off to Lost Lake. Eby Pim knew Lost Lake is going bankrupt, and with a heavy heart, she finally decides to sell it. When this news comes out, Eby’s old friends started coming back, to spend one last time in the lake. Eby thinks she made the right decision, but something doesn’t sit well with her. Lost Lake is a place where lost people find themselves, so what happens when they lose it? I got lost in Lost Lake a few pages in, and I mean that in a good way. There’s the usual magic and beauty in this book. It’s not quite the same as Garden Spells, a bit more similar to The Girl Who Chased the Moon, but still unique in its own way. I really liked the setting. Most of my vacations by the water involve the beach – sun, sand and whatnot. Lakes aren’t too common here in the Philippines (at least, there’s not much of them that I know), so a lake vacation is interesting to me. I loved the old cabins, the lake that seemed like magic, and all the other memories that the cast of characters had in the lake. The history gave the place a lot more personality, and it was so nice to dip into all of it and see how much the place meant to everyone in Suley. I wanted to be there in Lost Lake, too, to witness the magic of the place first hand. But in a way, I guess I was there, too. True to form, SAA’s words brought me there, too, and it was such a pleasure to be there. Reading this felt like a vacation, the one where I made new friends in the form of the characters in the story. I loved Eby and Kate and Devin, but the people who really shone here were the secondary characters – Lisette, Selma, Buhladeen (I love her name), Wes, the alligator. I loved them in their signature quirkiness, their whimsy and the little magic that they call carried in their own. The thing with SAA novels is that even if there is a little bit of magic, somehow you’d still believe that they were just normal, everyday things. That’s what I love the most about magic realism – how magic is not new, and how it’s all so subtle but it leaves a big mark in the character’s lives. Lost Lake was good, except maybe compared to the other SAA books, it had a little of a lost quality to it, too. I don’t mean it in a bad way; perhaps there was just too many things to love that I couldn’t really settle into any of them to love them fully. I suppose this isn’t bad, but I had a lot of books for comparison and Lost Lakepales just a little bit in comparison to the others. If you’re new to SAA and you want to dip your toes into her stories, then this may be a good one to start with, and then I would recommend you read her others, too, because trust me: it gets better from there. There was so much happiness in the world. It was everywhere. It was free. Eby never understood why some people, people like her family, simply refused to take it. Magic is what we invent when we want something we think we can’t have. All the women in their family had sturdy frames. They weren’t meant to break, but most of them did anyway, blown down by that perfect storm called love. If we measured life in the things that almost happened, we wouldn’t get anywhere. We are conduits for happiness. Remember that. You can’t change where you came from, but you can change where you go from here. Just like a book. If you don’t like the ending, you make up a new one. When your cup is empty, you do not mourn what is gone. Because if you do, you will miss the opportunity to fill it again. Sometimes, the best endings are the one that surprise you. Sometimes, the best are the ones that have everything happening exactly how you want it to happen. But the absolute perfect endings are when you get a little of both.